George Orwell’s tale of a revolution betrayed is brought to the stage by the Tumanishvili Film Actors Theatre from the former Soviet republic of Georgia. Georgia’s most famous son was the model for the pig leader, Napoleon; former Soviet leader Josef Stalin. In this allegory, the animals of Manor Farm overthrow the rule of the tyrannical Farmer Jones and set up a new regime where all animals are equal under the new ideology of Animalism. 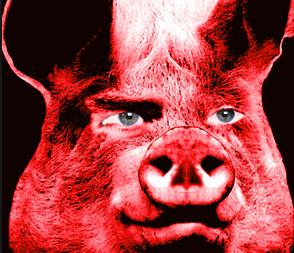 However, to defend the revolution, the newly christened Animal Farm gradually cedes, without realising the consequences until it’s too late, all power to Napoleon and his coterie of pigs. Stalinism is dead and gone everywhere but in North Korea but the temptation to trust a ruler who is ‘always right’ is still with us today. Animal Farm is great reminder of the truth of the words of the Psalmist who said, ‘Put not your trust in princes’.